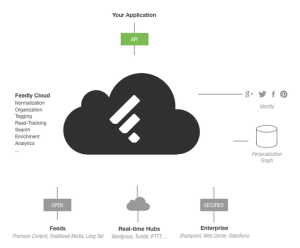 Feedly, the web service that inherited a large number of Google Readers users when Google pulled the plug on it, is now offering an API for developers who want to use the Feedly Cloud. You can use the API to access the more than 30 million feeds harvested and indexed by Feedly. The API allows the application to authenticate as a particular Feedly user, or to access everything. Developers can sign up for the Feedly Cloud Developer Program and gain access to the developer sandbox. Signing up gives you a client id and client secret you can use to authenticate to Feedly. Completed applications can be pointed at the full Feedly data store. The goal is to make subscribing to RSS feeds a painless process for a first-time user. With Qrius, users will simply click the icon featured on any of their favorite news sites, then sign in to the service using an existing Facebook, Twitter or Google+ login. In its first iteration, Qrius will automatically send subscribed content to Taptu — a news reading platform also owned by Mediafed that offers content aggregation. The idea is to add yet another “chicklet” icon to your web page (next to your Tweet this, Facebook this, etc., badges) that would send your RSS feed to the Taptu application. Qrius apparently plans future integration with Google Reader, but isn’t aiming for that user set yet — after all, people who use Google Reader are already the same folks who understand what RSS is for in the first place. In another sign that RSS is continuing to lose its consumer focus, Google announced on Friday that it is eliminating the “AdSense for Feeds” business (see More Spring Cleaning on the Google blog). AdSense for Feeds allowed blog publishers to put ads directly into their RSS Feeds, item-by-item. As long as you channeled your RSS feed through FeedBurner, you could have Google apply advertisements to your feeds as they were displayed in the end-user’s browser. While RSS feeds clearly have much utility, Google’s action is another clear signal that consumers are not reading RSS feeds directly in aggregators or their browsers the way they once did. Google is moving fairly quickly to eliminate AdSense for Feeds. According to the announcement, they will “start to retire it” on October 2, and close it on December 3. This does not effect FeedBurner URLs directly, just the ability to have Google place advertisements in them. Presumably, Google will continue to place advertisements in Google Reader when it displays feeds, but you won’t get a cut of the action. If you’re an AdSense for Feeds user, you can read more about what this means at https://support.google.com/adsense/bin/answer.py?hl=en&answer=2777193. Is RSS being forced out by technology companies that want more control over all aspects of the user interaction? That’s the contention of an article recently published in the Sydney Morning Herald (see “Apple Joins the War on RSS,” by Adam Turner, 1 August 2012, via the RSS Specifications blog). Turner points out how RSS is no longer a part of either Apple Mail or Apple Safari in the latest version of its operating system, Mountain Lion. He goes on to show how major Internet sites like Facebook and Twitter have been removing the in-built RSS feeds from their pages, making it harder to subscribe to information streams without subscribing to the service itself. Google Plus, Turner notes, never had RSS to start with. 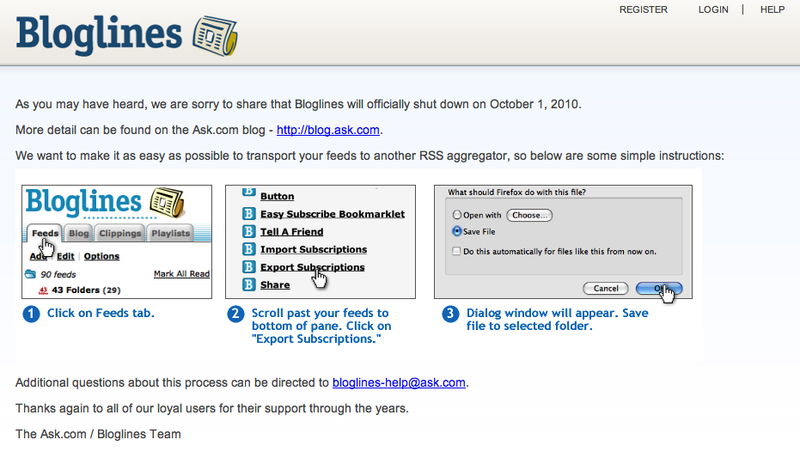 When RSS started, it was a tool for individuals to use to track web sites and people they are interested in. In the early 2000s, sites tried to get you, the reader, to subscribe to their RSS feeds as a way to retain readership. By the late 2000s and first view years of the teens, RSS was less a selling point, but a fundamental part of any web site. It had evolved into an open, universal data exchange standard for web sites. Applications could easily sniff it out (through the headers, read only by applications but not seen by human users who didn’t view a page’s source, of web pages). Perhaps this change from shiny fixture on the kitchen counter to plumbing behind the wall was not a sign of its fundamental importance, as I posited previously. As Turner points out, the HTML code to indicate the presence of an RSS feed is increasingly rarely even seen in a web page’s header. For example, look at the source of the RSS4Lib Twitter profile page or the RSS4Lib Facebook Page. No relative link in the document header to let an application know that there’s an RSS feed present. While I regret the change in philosophy that has led popular social networking sites from making it harder for the content on the site to be used in other venues, I suppose I understand it. I imagine the Twitters and Facebooks of the world are thinking something along the lines of this: “If we can prevent that scourge of openness, RSS, from liberating individual user’s content, we can sell more ads or control more interactions.” In a commercial sense, that’s plausible, even if not wholly reflecting reality. At the same time, if Apple no longer indicates that RSS feeds exist in pages that you visit in Safari (and if other browsers follow suit), that’s will drive a fundamental change in the way individuals discovery and access Internet content. Sure, discovery will happen, but it will happen through your social networks, mediated by major services. And it will happen in short-form: a few characters in a tweet, or a snippet on Facebook. It won’t happen in long-form, in a context that you (the consumer) manage. If information wants to be free, as the saying goes, it needs a path to follow. RSS seemed like it was that path. What’s next? Pinterest (http://www.pinterest.com/)is the latest social media tool to emerge from the fringes to the spotlight. It’s something of a social media bulletin board for interesting images. Once you set up an account (invitation only, but you can request an invitation — mine came within hours), you are given a bookmarklet tied to your account so that can start pinning images you find on the web. When you’re on a page that has an image you want to “pin,” you click the bookmarklet. Pinterest shows you thumbnails of all the images on that particular page. You select the thumbnail image you want and the board you want to add it to (you can create as many boards as you like). Some libraries are putting up cover images of new books, best sellers, or interesting books from the collection. The Darien Public Library, unsurprisingly, was an early adopter. The library’s Pinterest page has lists of books on various themes ("Best Books for Babies & Toddlers," "Newberry Medal Winners," and a board for their "One Book, One Community" reading program — images related to the books selected for adults and children. Promoting images from special collections. The Bluffton University’s archives have a Pinterest board with selected images from their special collections and archives, including images of beanies (the hats, not the stuffed toys) and time capsule covers. The Staley Library (Millikin University) has a set of images related to the university’s history. Put up photos of your library’s staff along with brief bios or areas of specialization. I haven’t been able to find a library doing this, but surely there is. Anyone? Create boards related to popular books. The Westerville, Ohio, library has boards for The Hunger Games and Memoirs of a Geisha . One of the interesting challenges faced by Pinterest is that of copyright. Pinterest works by copying a thumbnail image of whatever it is that you pin. When you pin an image, the original is linked from the thumbnail. While probably not, strictly speaking, allowed by copyright law, I suspect Pinterest is operating under the theory that if Google can cache a thumbnail of an image (or even of an entire web page) for its search tools, then they can do the same. Complications arise, though, when one Pinterest use copies an image from another. You can "repin" another user’s image to one of your own boards. At that point, you’ve created another copy of the image on your board that links to the "original" — that is, the thumbnail on someone else’s board — and not to the original artist’s. There’s been quite a kerfuffle about this of late. There’s a very nice summary of the issues around "pinning" things at the University of Minnesota’s Copyright Librarian blog (and a follow-up post) that I encourage you to read. It summarizes the issues far better than I can. Pinterest doesn’t document its RSS feeds well, but I stumbled across some instructions for how they can be made. To get an RSS feed for all of a particular user’s boards, add “feed.rss” to the end of the user’s Pinterest page. So, for example, for RSS feed for the Darien Public Libraries Pinterest account is http://pinterest.com/darienlibrary/feed.rss. To get an RSS feed for a specific board, remove the end “/” from the board’s URL and then add “.rss”. So the Darien Library’s Best Books for Babies and Toddlers board has the feed http://pinterest.com/darienlibrary/best-books-for-babies-toddlers.rss. The symbol itself is the link to the source. Curator’s Codes could be rendered in line, much like a brief citation, or used as freestanding blocks. Or, really, in any way that’s sensible to the author. As in, for example, the hat tip for this post: ᔥ David Carr, “A Code of Conduct for Content Aggregators”. As we madly link from thing to thing, and others, in turn, pick up our post and run with it, quoting here, paraphrasing there, it’s all too easy for something one author says to be lost in the expounded thoughts of another. Making a simple, standard, way for authors to cite others is a good thing. And to quickly indicate the kind of citation — are you quoting or paraphrasing, or giving credit to someone else who sparked a thought? Standardization may be a good answer. It could even lead to better machine parsing of interconnections between blog posts, tweets, Facebook, etc. — if adopted. Update 13 March 2012: There’s an interesting contrarian view at The Brooks Review. Web Scale Discovery systems (products like Summon, EBSCO Discovery Service, Primo Central, and so on) make their customers love them through their comprehensiveness. These systems index hundreds of millions — some approach a billion items — from scholarly and popular sources, library catalogs, institutional repositories, and more. No matter how esoteric the topic you are looking for, you’re almost certain to find something that’s related. Or close to being related. With their vast reach, these discovery systems open the door to being almost omniscient alert services. Their coverage is vast, so whenever something new is published on a topic, it is likely to find its way into the discovery index. The challenge, it turns out, is in letting people know when something new is available. Discovery systems are primarily retrieval systems. They cast a wide net, and sort their results in relevance order. When something new is added to the index and the same search is run, the new items appears somewhere in the list. This is the challenge for any kind of current awareness system (whether it is RSS or email alerts). If the system simply runs the search again and provides an RSS feed of the 100 most relevant results, for most searches, the new material will be nowhere near the top and the feed will contain exactly what you have already seen. For many topics, the new items won’t even make the relevancy cut and will be excluded. If the system runs the search and provides an RSS feed in reverse chronological order (newest items on top), the newest items may well be so far down the relevancy ranking that they are, in fact, nearly irrelevant. Try a couple experiments. Do a search in your favorite tool and move down to the 5,000th result. Is it the item you’ve been looking for all your life? Almost certainly not. Do the same search, but resort by publication date (newest first). Is the top result relevant to your query? Again, probably not. So what is needed is some sort of hybrid, database structure. The items from the original search result set that pass some relevancy threshold need to be saved. Whenever new items are added, these new items are compared to the existing list. If they are more relevant than items in the previously seen list, they are added to an alert, and the list of previously seen and previously alerted items grows. Figuring out which are new (to the user) items is not trivial. Discovery and RSS are almost inherently at odds with one another. Any ideas on how to build a usable RSS feed to stay apprised of a topic? Graphs and the full report are available on the bitly blog. Of course, this post is immortal, because as we all know, blog posts never die. Right? The inevitability of this, in retrospect, seems enormous, and I’m surprised my fondness for Bloglines’ simplicity has made me put up with its quirky behavior. (Quirky, of course, means almost constant brief outages on their perpetual beta version.) Bloglines’ move into selling advertisements on its front page (see Bloglines Succumbs to Advertising from September 2008) was obviously not enough to bring in the revenue needed to keep the service. When your only serious competitor is Google, I suspect almost nothing can save you. The real-time information RSS was so astute at delivering (primarily, blog feeds) is now gained through conversations, and consuming this information has become a social experience. As Steve Gillmor pointed out in TechCrunch last year, being locked in an RSS reader makes less and less sense to people as Twitter and Facebook dominate real-time information flow. Today RSS is the enabling technology – the infrastructure, the delivery system. RSS is a means to an end, not a consumer experience in and of itself. 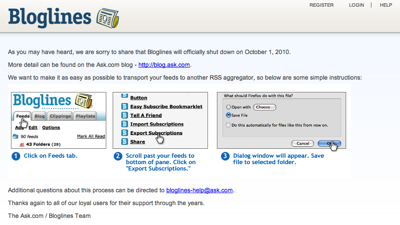 As a result, RSS aggregator usage has slowed significantly, and Bloglines isn’t the only service to feel the impact. The writing is on the wall. I made a similar point about the phase change in RSS from being a commodity in itself to being a transport mechanism in September 2009. Just as soundbite reporting in television and radio news changed that medium, so has ‘textbite’ exchange of information on the Internet. The overwhelming force of the conversation in Twitter and Facebook — where the granularity of information exchange is much smaller and seems to permeate the Internet with greater fluidity — has changed the game. I’m not giving up on my RSS feeds (from blogs, news services, and other sources), but I’m switching to the only other game in town: Google Reader.